On Monday, Public Rights Project, with the help of its pro bono counsel at Cohen Milstein, filed an amicus brief in a case that could have a devastating impact on access to credit, housing, and employment, especially for vulnerable people. 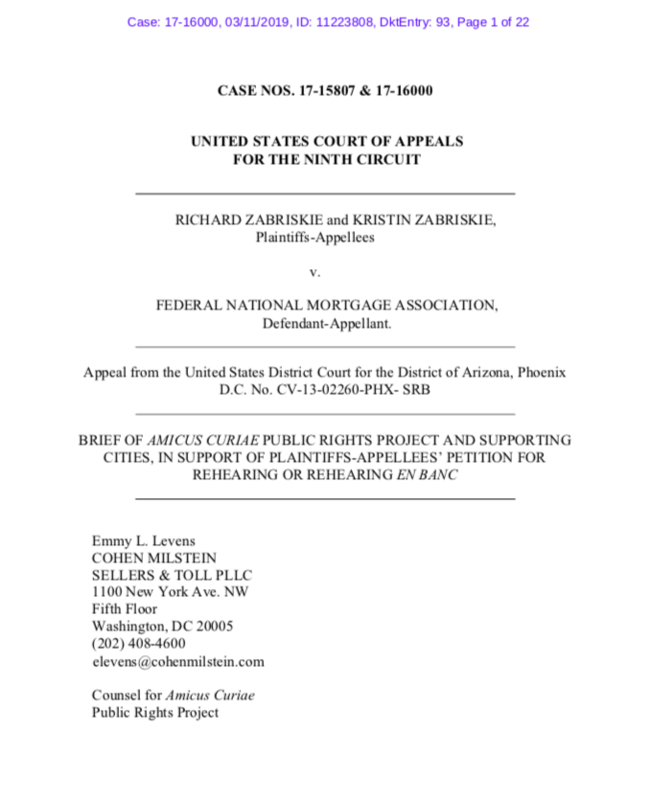 Along with the cities of Baltimore, Seattle, Oakland, Columbus, Flint and Santa Cruz, PRP asked the Ninth Circuit Court of Appeals to reconsider a decision in Zabriskie v. Federal National Mortgage Association that would have opened the door to widespread evasion of the Fair Credit Reporting Act, which ensures that the credit reports and background checks used in determining eligibility for loans, housing, and jobs are fair and accurate. “The signatories to this brief—including cities representing over 2.3 million residents—wish to highlight two issues of exceptional importance presented by this appeal which warrant review by this Court en banc. Immunizing companies that rely on algorithms from liability under the FCRA contravenes the plain language of the FCRA and related precedent, harming City amici and their residents’ ability to obtain employment, rental housing, mortgages, and more. As society becomes increasingly automated, the critical importance of requiring consumer reporting companies that rely on algorithms to ‘follow reasonable procedures to assure maximum possible accuracy of the information concerning the individual about whom the report relates,’ 15 U.S.C. § 1681e(b), cannot be overstated.” Read our brief here. Older PostNew Fellowships And Ways You Can Help!